Japanese Episode AG 064: "Chirutto no Sora! Haruka no Kokoro!!" American Episode 336: "True Blue Swablu"
After a violent storm ravages the countryside, our heroes find themselves walking through the remains of a forest on the road to Touka City. Our heroes stumble across a Tyltto, a small bird pokemon whose wings had been hurt in the storm. Haruka takes a liking to the pokemon and decides to help it recover, so she takes it to a nearby cabin. Haruka looks after the pokemon until its wings heal, but Tyltto is still unable to fly. Satoshi wonders if the pokemon could have forgotten how to fly, so the group sends out its flying pokemon (Agehanto and Subame) to teach it how. Tyltto doesn't respond to the lessons, so Takeshi guesses that the pokemon is afraid to fly. Masato comes up with a plan to help Tyltto overcome its fear, and his "magic powder" plan seems to work. Soon, Morita, the park ranger whose house Satoshi-tachi was staying in, announces that he's found the flock that Tyltto had gotten separated from. Morita drives our heroes to the lake where they're supposed to be, but the Rocket-Dan launch an attack before they arrive. Much to Haruka's dismay, Tyltto seems unable to fly without Masato's special "magic powder!" Masato tells Tyltto that the powder wasn't magic, and that the pokemon flew of its own accord. After cheering the pokemon on for a while, Satoshi-tachi is able to watch as Tyltto regains the ability to fly. After sending the Rocket-Dan packing, the groups arrives at the lake. However, Tyltto's flock is nowhere to be found! Haruka is about to capture the pokemon for herself when a group of Tyltto and Tyltalis arrive! Haruka decides to let the pokemon go with its flock and returns on the road to Touka City, hopeful that she'll meet her good friend once more. Whenever people talk about this episode, there's always one idea that's always expressed: "MAY SHOULD HAVE CAUGHT THAT SWABLU!!! WHAT WAS SHE THINKING!?!?!? OMG WTF !!!11!!1!!!oneone!!!" And really, you can't blame people for thinking this. It was the perfect pokemon for her, and the fact that the writers teased us by showing her actually pick up a Monster Ball to capture the thing makes the fact that she didn't do so that much more infuriating. But then again, you have to realize that it's completely in character for Haruka to let the pokemon go off with its flock, and I certainly can't imagine her being like "Screw your family, you're coming with me!" before dragging it away from the flock. By the way, I'm using Nintendo of Japan's official romanization of "Tyltto" even though I'm not sure what they're trying to go for with that name. I've heard it (along with Tyltalis) is supposed to be French or something, but it doesn't sound like any French I've heard (and I've been studying French off and on for about five years now). Does anyone know where this name is supposed to come from? Anyway, the dub doesn't hold any surprises. Morita kept his Japanese name, but the dub mispronounces the hell out of it (they stress the middle syllable when none of the syllables should be stressed at all). I'm all for keeping the Japanese names and all, but if you're not going to do it right, you might as well have changed his name to "Morton" or something like that. Four seconds are cut from the opening shot of the episode. Then, a second is cut from the scene right after the episode's title screen. 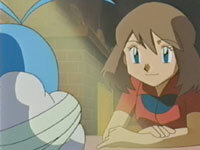 During the montage of Haruka taking care of Tyltto, the eleventh ending theme to the first series, Boku no Besuto Furendo e, plays in the background. It's a rather pretty song, and I think it actually fits the scene rather nicely. In the dub, it's replaced by a number of different musical cues, as usual. The Japanese version has another insert song play in this episode; this time, the song is the often-heard Ready Go! !, and it plays from the part where Satoshi and Pikachu put on fake wings to show Tyltto how to fly up until the night scene (if it played in the dub, it would play until the Trainer's Choice commercial break). Of course, we don't hear this in the dub. And finally, a second is cut from the TO BE CONTINUED... screen.